Mitsubishi Materials is proud to announce the expansion of BC8110 for GY Coated CBN Grade for Grooving Hardened Steel. BC8110 provides longer tool life, when grooving hardened steels. PVD coated CBN insert with a new TiAlSiN technology for excellent wear resistance. The Ultra Micro-particle Binder in the body is designed to prevent sudden fracture. Optimized cBN grain size and cBN content increases wear resistance and edge toughness. Best used with Hardened Steel. 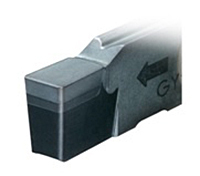 Covers the wide application range for continuous cutting of hardened steel. TiAlSiN technology prevents coating exfoliation to reduce unusual wear. Can be used with and without coolant.